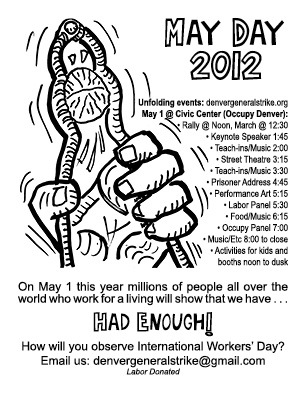 A leaflet, in English and Spanish, is now available, giving the line-up of Occupy Denver-sponsored events in Civic Center Park on May 1 (subject to change). Note that there are two versions. Click on an image below to download the version you want. 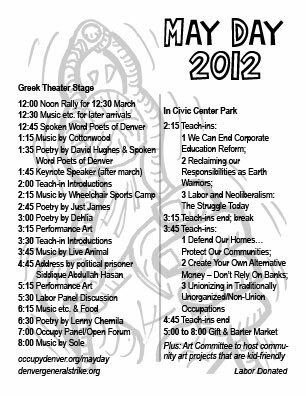 This was written by Denver General Strike Committee. Posted on Saturday, April 21, 2012, at 5:34 PM. Filed under Events, Leaflets & Posters. Bookmark the permalink. Follow comments here with the RSS feed. Both comments and trackbacks are currently closed.